Melanoma is the most aggressive form of skin cancer. 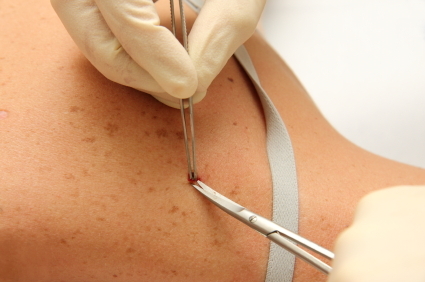 Once your dermatologist detects melanoma, other tests are necessary to find out if cancer cells have spread either to other parts of the body or within the skin. Find out about the staging process, procedures and tests used in this process, and the ways melanoma spread in the body. Staging is the process used to find out if the cancer has spread within the skin or to other parts of the body. The results of the staging process help the dermatologist determine the stage of the cancer, which is important for the treatment decision. Be sure to discuss ask your dermatologist about the stage of your melanoma cancer. Physical Exam and History: This is where the doctor examines your body to check for signs of disease, such as lumps or anything else that seem unusual. He or she also checks for general signs of poor health. Also, the history involves an assessment of your health habits and past illness. Wide Local Excision: The dermatologist does this surgical procedure to remove some of the normal tissue around the area of the abnormal tissue. He or she sends this tissue to a pathologist, who will then study this tissue in search of cancer cells. Lymph node mapping and sentinel lymph node biopsy: With this procedure, a blue dye and a radioactive substance are injected near the tumor. The dye or substance flows through the lymph ducts to the node or nodes where cancer cells could located. These nodes are known as the sentinel nodes. The surgeon removes only the nodes with the dye present. A pathologist then views a sample and checks for cancer cells. If no cancer is found, then removal of additional nodes is not usually necessary. Chest X-ray: To examine the organs and bones inside the chest, the dermatologist takes an X-ray. An X-ray is a type of energy beam sent through the body and onto a film to make a picture of the areas inside the body. CT Scan (CAT scan): This involves a series of detailed pictures of areas inside the body taken from several different angels. A computer linked to an X-ray machine puts these pictures together to create a clear image of your inside organs and structures. Sometimes, a dye will be injected into a vein or swallowed to help the organs or tissues show up more clearly. This is called computed tomography. Pictures may be taken of the chest, abdomen and pelvis for melanoma. MRI (Magnetic Resonance Imaging): With this test, a magnet, radio waves, and a computer all make a series of pictures of areas inside the body. Also called nuclear magnetic resonance imaging, this procedure can be helpful in determining if cancer has spread to other areas of the body. PET Scan (Positron Emission Tomography Scan): Doctors do this test to find malignant tumor cells in the body. A doctor injects a small amount of radioactive glucose, or sugar, into a vein. The PET scanner rotates around the body and creates a picture of where glucose is being used. The brighter spots in the picture show malignant tumor cells, because they are more active and use more glucose the normal cells. Laboratory Tests: These are the normal medical procedures that test samples of tissue, blood, urine or other substances of the body. Laboratory tests can be helpful to diagnose disease, plan and check treatment, or monitor a disease over time. Blood Chemistry Studies: With these tests, a blood sample is checked to measure the amount of certain substances that organs release into the blood and tissue. LDH, or lactate dehydrogenase, is the enzyme doctors look for to help detect melanoma. If LDH levels are higher than normal, it alerts the dermatologists to possible melanoma. When cancer cells metastasis, they break away from the original, primary tumor and travel through the lymph or blood to other places. Then, they can form another tumor, called a secondary tumor. The metastatic or secondary tumor is the same type of cancer as the primary. For example, if breast cancer spreads to the bones, the cancer cells in the bone are actually breast cancer cells. Therefore, it is not bone cancer, it is metastatic breast cancer. Through tissue: This is where cancer invades the surrounding normal tissue. Through the lymph system: This is when cancer invades and travels through the lymph vessels into other parts of the body. Through the blood: This is where cancer invades the veins and capillaries and then travels to other places.